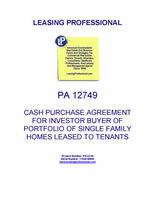 This Purchase Agreement is for a portfolio of single family homes leases to tenants. The agreement contemplates an all cash purchase of the single family homes by an investor purchaser who will step into the shoes of the seller as the landlord under the leases to the existing tenants. The purchase price is to be paid in all cash following the due diligence review and approval by the buyer. The seller is required to furnish a laundry list of due diligence materials to the buyer as itemized in the agreement. The agreement also contains a bill of sale and assignment for personal property including appliances contained in the single family homes conveyed with to the purchaser, a certificate of non foreign status (FIRPTA Affidavit) and a list of all service contracts for the property included as exhibits.